Front Steps on Amelia Street, wearing a French Market find. 1. Where to eat, Bonjour comment puis-je decider!!! the discussions would start at breakfast on where to eat for lunch or dinner. The choices seem over whelming, but something that works for me when I travel is to zero in on location and the types of food I personally enjoy. When in NOLA I gravitate towards Cajun and French cuisine. Olde Nawlins Cookery ( 205 Bourbon Street ) and the deli counter at Rouses Lower Garden District are equally worthy for winning top place for #crawfish. The La Petite Grocery Lower Garden District had sublime crab stuffed beignets and a wonderful french inspired Shrimp and Grits. 2. Where to stay, " c'est si difficile! after much searching on many sites we settled on a VRBO listing in the Lower Garden District just off Magazine street. The beautiful townhome was over 120 years old with original heart pine floors, high ceilngs ,tall windows , a majestic oak shading the front landing and I swear a ghost! I promise one night I woke up and heard a lovely swishing sound moving around my bedroom. My Aunt said it was the oak tree outside, but as I lay there watching the shadows dance around my room I felt like someone came to visit and tidy up the mess of clothes I had made. I am artist, so yes I have an imagination, but really why were my clothes neatly folded when I woke up the next morning!?? you can find this listing on VRBO #4504391. 3. 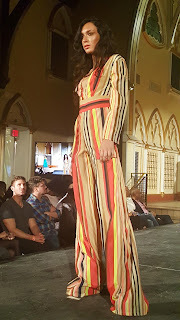 How to spend your day, should I shop, sip or walk or as the French would say "faisons tous les trois, faire du shopping, marcher et boire ".. My schedule was pretty busy as I was in town for New Orleans Fashion week and my call time was 1pm each day. I had Friday off so it was with great pleasure I woke up early and took a walk around the Lower Garden District , taking in beautiful gardens and sub tropical foliage. I joined my mom and Aunt for breakfast at Surrey's Uptown and meandered along Magazine window shopping. We decided to ride on over to the French Market and after practicing my parallel parking skills walked in a zig zag through the Quarter residential area and arrived at the foot of Decatur Street. I scored a great buy on a block of shea butter from Africa, enjoyed some people watching while sipping on a cold drink at Belle's Diner on Decatur street, and there is no trip complete without some hot sugar dusted beignets! Shop & sip or sip & walk it made for a wonderful day. If you are one who has difficulty making decisions I hope I have given you the travel bug to plan a trip to New Orleans; stay a few days, enjoy the food, the scenery, the shopping and maybe meet a ghost. 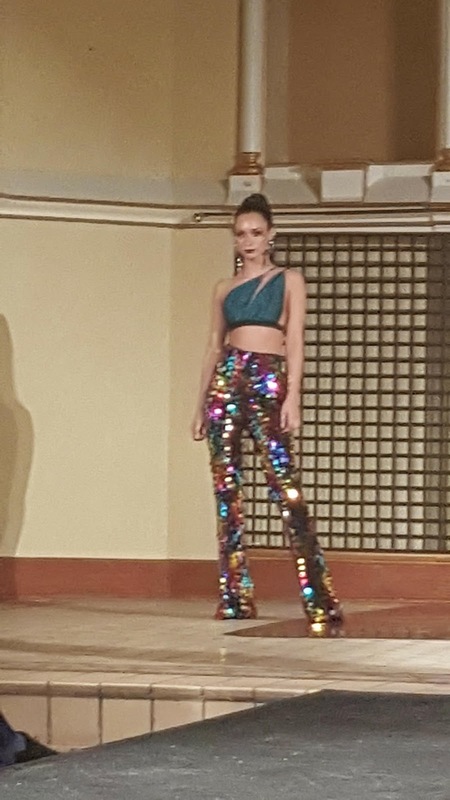 For those of you that follow me on social media you have already seen some photos of the designs I was blessed to model at New Orleans Fashion Week, it takes place each year in March, generally following St. Patricks day. As an artist I congratulate all the designers who presented. Many parallels between the design world and musical artists can be found. " We all have to find our audience and We all must have perseverance". Shoutouts to these very talented designers: Candace Cullison of "Gerald Michele", Victoria Henley of the Victoria Henley Collection, Oonarissa Brown Bernard, Damien Daniel and Haus of Brik designer Brik Allen. p.s.s.s.s. can't wait till next year!